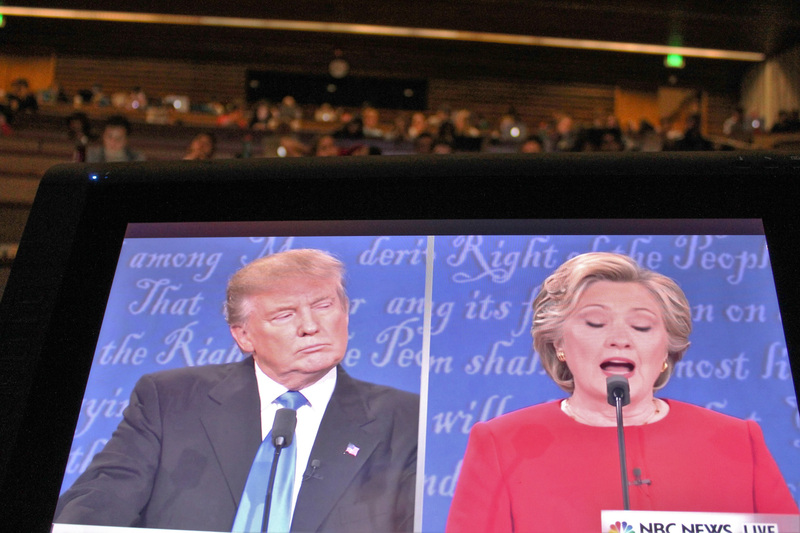 Over 80 million people watched this election’s first presidential debate on Sept. 26, making it the most-watched debate in United States history. Among those watching were hundreds of University students, tuning in from various formal and informal screenings around campus. The two largest organized debate-watching events this year were in the Usdan University Center and the Exley Science Center, hosted by the Usdan Center Activities Board (UCAB) and Arcadia Magazine, respectively. At Exley, a watching party was hosted in Tischler Hall for a sizable and enthusiastic audience. Arcadia Magazine is a multi-partisan magazine dedicated to the full spectrum of political thought, originally started by the Wesleyan Democrats and the Wesleyan Republicans. Audience members in Tischler Hall filed in minutes before the debate began, munching on snacks provided by Arcadia Magazine and taking seats in the large lecture hall. The debate was broadcasted on a large screen visible to students sitting in any corner of the room. After a few minutes of “The Voice,” the debate began promptly at 9 p.m. and students quieted down to listen and watch. Arcadia Magazine asked the audience to be respectful and avoid arguments or fights, but acknowledged that the hall need not be silent. Students were vocal throughout the debate, expressing their reactions at various poignant or memorable moments. There was a clear bias for presidential nominee Hillary Clinton in the room, evidenced by the reactions of the crowd throughout the event. Many students also scoffed loudly when Trump said, “I also have a much better temperament than she does.” Clinton’s reply after Trump’s assessment of her temperament, a terse “Okay” with a wry smile, was met with a roomful of applause. A favorite debate moment for the students watching in Tischler Hall was Hillary’s response to Trump’s comment about her lack of stamina. “As soon as he travels to 112 countries and negotiates a peace deal, a cease fire, a release of dissidents, an opening of new opportunities in nations around the world, or even spends 11 hours testifying in front of a congressional committee, he can talk to me about stamina,” Clinton said, and the room went wild. There were other moments that students enjoyed, including, according to one student, the instances in which Trump was clearly uncomfortable. “I liked the parts where [Trump] was sipping water and looking really unhappy,” Susana Hair ’20, who was an attendee of the event, said. In Usdan, the debate-watching party took on a different, more informal tone, with students sitting in clusters at tables or on couches. The debate was broadcasted on multiple screens around the floor. UCAB also provided cupcakes that students were able to decorate. However, according to Grace Snyder ’20, the snacks were not the only thing that differed between the screenings at the two locations. Emma Greenfield ’20 echoed this sentiment. “It was more casual [at Usdan]; I felt like at Arcadia, people were working and were really into the debate at the same time,” Greenfield said. Despite the difference in locations, students enjoyed watching the debate with their peers. Many students interacted with each other before and after the debate, trading thoughts and expectations. Even throughout the debate, students kept a running commentary in both Usdan and Exley. 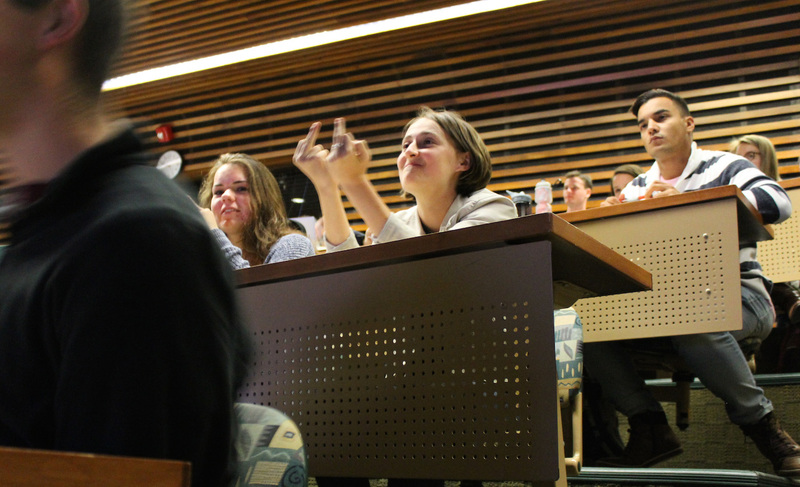 In some ways, however, some students found the debate slightly disconcerting. For Snyder, the debate was evidence of the perpetuation of mainstream media and entertainment craze. Despite this consideration, overall reactions to the debate were positive, and both events were objective successes. Many students enjoyed watching the debate, as evidenced by the sheer number of individuals who tuned in from locations around campus, as well as the general reactions of students after it was over. “[This debate] is a completely unique experience that would not have happened at any other time period in the U.S.,” Hair said. The forum missed a very critical point about the global economy. The global economy is exhausted because it is driven by a very large pile of debt and there may not be enough funds to liquidate it. Hence a global slowdown. Politicians and the media don’t want to talk about it but people at large are not fooled, are concerned, and are driving “nationalistic” (anti-globalization) movements. It certainly explains the large number of “deplorables” (as per HC) and polling trends in the USA. Best to keep this in mind as the USA moves forward to the November election.